A British vote on whether to quit the European Union is still months away but the pound is already taking a beating. Investors are worried about the possible economic fallout of a decision to leave, the odds of which rose after the high profile mayor of London said he would campaign for the so-called Brexit. The pound fell against all major currencies on Monday morning. 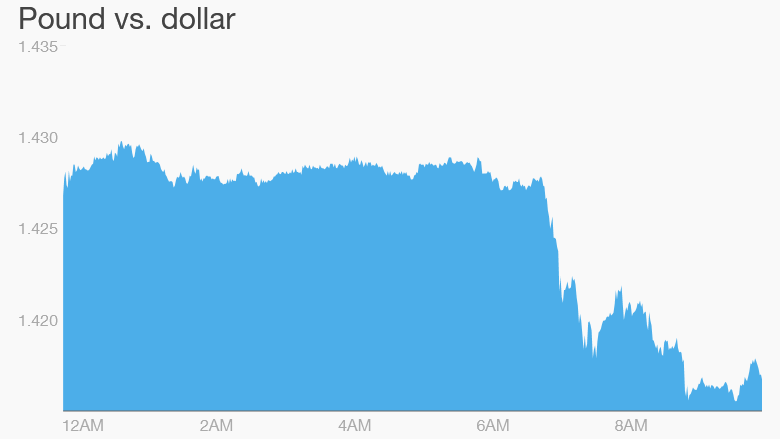 It was down 2% against the dollar to $1.41, the lowest since early 2009. The pound also dropped 1.3% lower against the euro. "We are likely to see further sterling weakness ahead of the vote itself, as the debate rages and uncertainty undermines confidence," said Kit Juckes, a strategist at Societe Generale (SCGLF). His bank rates the risk of Brexit at 45%. 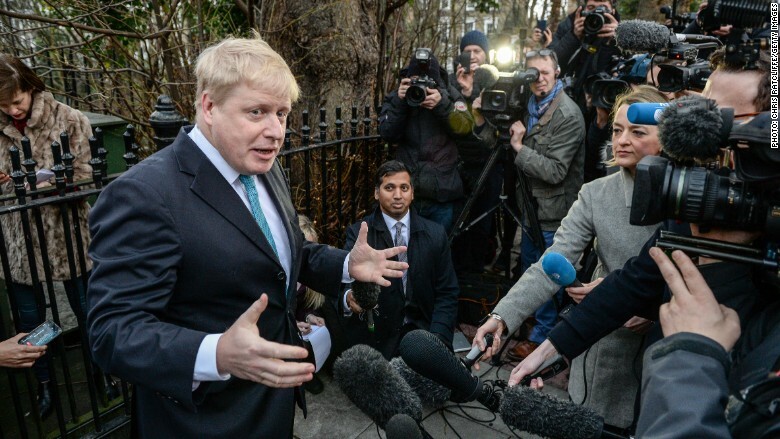 Sunday's news that London mayor Boris Johnson was joining the Brexit campaign prompted major British betting firm Ladbrokes (LDBKY) to cut the odds on the U.K. leaving the bloc from 15/8 to 2/1. The mayor of London is one of the most high profile politicians in the country. 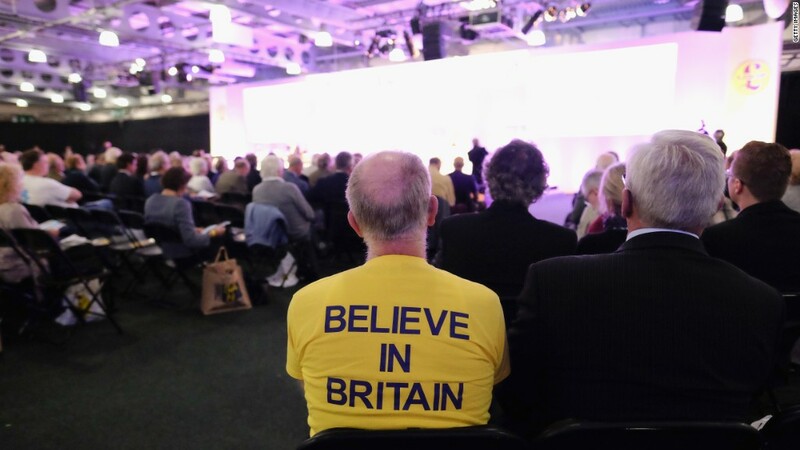 Britain will vote on June 23 whether to stay in the union. Opinion polls show Europe's second biggest economy is bitterly divided over the issue, with large numbers of voters still undecided. "From a market perspective, the most likely barometer of uncertainty is the currency, and... we believe there is significant further downside potential for sterling in the build up to the vote," wrote UBS economist David Tinsley in a note. Many large banks have already spoken out in favor of Britain staying in the EU. They're worried about the impact of Brexit on trade, investment and financial services. Moody's warned Monday that it could downgrade the U.K.'s credit rating in the event of a Brexit. "The economic costs of a decision to leave the EU would outweigh the economic benefits," said Kathrin Muehlbronner, a senior vice president at the ratings agency. "It would likely lead to a prolonged period of uncertainty, which would negatively affect investment." Prime Minister David Cameron announced the date Saturday after striking a deal to give Britain "special status" within the EU in an attempt to keep the country inside the 28-nation union. Cameron argues that being part of the club is good for the British economy. But his opponents say EU membership is costly, creates regulatory red tape and allows unlimited immigration.